Howdy, Sig here! Adventure Pet’s official Ambassador and knower of all the dogs because I go on almost every single run. The others don’t know this, but some days I get to go on two adventures. It pays to have parents with the best job in the world. 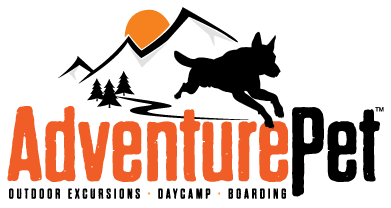 It’s so nice that Adventure Pet parents have been willing to share their testimonials about why they like Adventure Pet, but my friends and I have been talking and we thought it was important that you hear from us. It’s not all about sniffing butts, people. We have serious business going on during an adventure. See, parents are great and well-intentioned, but the truth is they don’t really experience Adventure Pet. They don’t know first-hand how awesome our adventures are. So while we appreciate their kind words we’re going to tell you what really happens and why us dogs really love Adventure Pet. Mylie and Ebony volunteered to go first, so I hope you enjoy their story. Mylie: Hey everybody! So, we’re Mylie and Ebony and we’re here to tell you all the things we love about Adventure Pet. Ebony: Oh, I could just go on and on about what I love. Mylie: Ebony, we agreed that I would do the talking. Ebony: I don’t remember agreeing to that. Mylie: You totally did. But anyway, so Ebony and I used to live with our mom at a place that had a super huge yard. But life changes and we moved and no more super huge yard. Ebony: But it’s still a nice house and I like it. Mylie: Don’t you think Mom has a nice decorating style? Ebony: Oh yes, Mom knows how to make a house a home. Mylie: Wait, back to Adventure Pet. So we were going a little stir crazy, and one day Mom invited these really nice people over. Their names are Troy and Stephanie. Ebony: Don’t you think Troy is dreamy? Mylie: He’s totally dreamy, but Stephanie always talks baby talk to us and I love that. I really do. I love the sweet talk. Ebony: You should tell everyone about our first adventure and how you freaked out and tried to run home. Mylie: Seriously? You had to bring that up? And what are you talking about? You were with me. Ebony: I was supporting you. I couldn’t let you run home alone. You might make me crazy but I’m not letting you run off on your own. You wouldn’t make it two seconds without me. Mylie: Whatever. It’s true that I was a little nervous that first time, but I learned after like two runs I had nothing to worry about. Ebony: It was more like four. Mylie: No, it was two. Mylie: Anyway! While it’s true that I was nervous we were so lucky that Stephanie decided not to give up on us. She was super patient with us and showed us that we had nothing to worry about and honestly, the best days of the week are the ones where she picks us up. Mylie: Finally. See, we are gorgeous as you can tell, but we aren’t just pretty faces. We are adventurers and runners. We totally need to run. Mylie: Exactly. And when we go to Adventure Pet Stephanie always makes sure to take us someplace cool. Ebony: Sometimes we hike in the hills and sometimes we even go to the lake. Mylie: I love lake days. 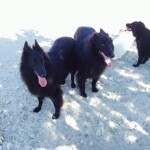 Ebony: Mom isn’t crazy about our fur after a lake day. Mylie: Mom is so silly sometimes. I just love her. Mylie: We also have friends we like to play with. My favorite is whoever is chasing the ball. Because then my natural herding instincts kick in and I get to pretend I’m herding sheep. Ebony: You do that, too? Mylie: What are you talking about? You’re right there with me! Ebony: Yes, but I didn’t know you were pretending, too. Mylie: Anyway, we run and herd and play and sniff until we’re so tired. It’s the kind of tired that feels good. Ebony: Don’t you think the after Adventure Pet nap is the best kind of nap. Mylie: Oh, yes. There’s no better kind of nap. So we nap a little in the van on the way home with our friends and then after Stephanie gets us back in the house and we have a nice drink of water it’s nap time but for real. Ebony: I think a nap sounds nice right now. Do you think we’ve covered everything? Mylie: Probably. Trying to tell this story has kind of exhausted me. But it’s important that people know that Adventure Pet is amazing and Stephanie and Troy always make sure we have fun and feel loved. Ebony: I love that about them. It happens every single time. I don’t think I’ve ever had a bad Adventure Pet day. Mylie: Nope. Not even one.